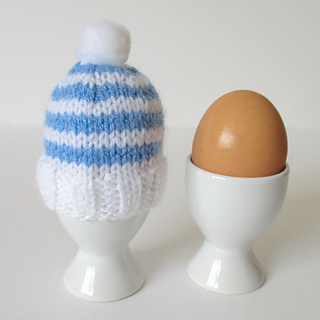 The egg cosy is approximately 7cm tall (not including the bobble) and 7.5cm diameter (un-stretched). 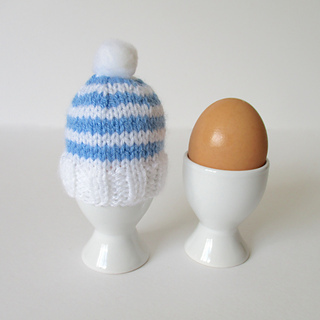 This simple egg hat is knitted in blue and white, inspired by Cornish Blue crockery. This is a great project for beginner knitters to try as you just need to know three stitches (knit, purl and a k2tog decrease), and this is knitted flat on straight needles (not in the round). TECHNIQUES: All pieces are knitted flat (back and forth) on a pair of straight knitting needles. You will need to cast on, knit, purl, decrease, work simple stripes and sew a seam. I have no objection if you wish to make these egg hats to sell to raise funds for charity. However please do not reproduce or sell this pattern.